A curious thing emerges from the five hundred plus page report issued by the National Transportation Safety Board on Thursday, as I reported here for APEX Editors Blog. 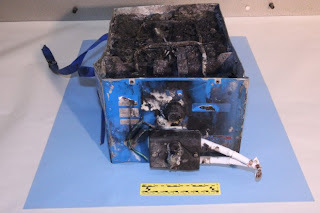 Despite all its talk about thoroughly, exhaustively, comprehensively testing the lithium ion batteries used on the Dreamliner, Boeing and its subcontractors failed repeatedly to gauge how separate components of the battery system would work together. Securaplane, producers of the charger for the 787 battery, tested its product. Thales, which was contracted by Boeing to design and create the battery system, tested some components. 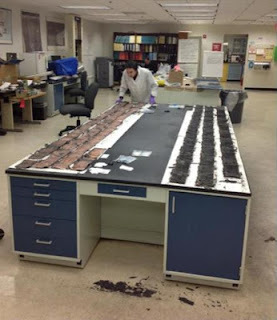 But when it came time to put it all together and run tests on the whole shebang, Thales failed to examine what was going on inside the eight individual cells that make up the Dreamliner's battery according to the NTSB report. "Securaplane is not off the hook, Thales is not off the hook," I was told by a source connected to the investigation who asked not to be identified. Neither, apparently, did Boeing or the Federal Aviation Administration, which is obligated to review - before approving - material submitted by a plane maker seeking certification. This is one of many curious findings in a volume of reports put out by the safety board. Another verrrrrry interesting section deals with how the battery on the Japan Airlines 787 acted when it started smoking at the gate at Boston's Logan Airport. Domenic Gates of the Seattle Times gives a overview you can read here. The NTSB's various working groups' have shoveled into a great big pile, a blizzard of documents, calculations, schematics and diagrams from Boeing all predicting how the Dreamliner would act in the "unlikely" case of a battery problem. Now all that paperwork is starting to look like a snow job because what actually happened on January 7th was a heap of a surprise. For starters there's the fire; the catastrophic circumstance Boeing claimed would not happen more often than one in a billion flight hours but did indeed occur on a plane with 169 flight hours. Then there's the device designed to vent smoke over board that did not work, because the vent is powered by the APU which is powered by, you guessed it, the battery which stopped working sometime after it started smoking. 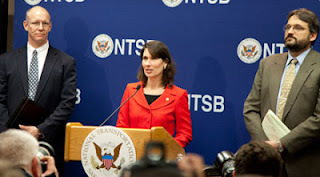 Given these errors in assessing what might happen on Boeing's newest airliner, NTSB investigators are said to be taking a look at some of the other issues raised by experts since the ignominious grounding of the fleet on January 16th. For example, MIT materials professor Don Sadoway has expressed concern about the placement of the four battery management system circuit panels so close to the battery cells. "If you have thermal runway, you fry the board," he told me. Certainly photographs distributed by the investigators with the Japan Transport Safety Bureau, indicate Sadoway may be correct. The panels' location inside the box is one of many, many aspects the NTSB is reviewing. From small details like panel placement, to the high altitude review of whether the plane got off the ground with a critical safety issue embedded it its power design, a five hundred page report appears to be just the start. Sure sounds like the blind men and the elephant to me. Its still a plane designed by a committee. Unlike other efforts however, it was never understood that outsourcing AND not having the input of the very experienced workers at Boeing involved in making changes to the drawings in the shop during assembly of PARTS and sub assemblies- which happened even at the battery and control board level - there was no one with practical shop experience doing the things that matter. In development of anything, such as complex commercial projects with hotels, offices, residential and also retail, there are always three functional phases : Design, Design Development, ( where designs are matched with structure and loading needs for example, and cost tradeoffs are made for the project), and then Working Drawings. With that all done, there is always a need for critical modifications to be made in the construction process itself. In the case of this airplane, it was assumed that none of these rules applied. There was an assumption, as it turns out a false one, that technical genius and management KNOWLEDGE and procedures was enough. That it what is wrong, as a result with the whole airplane. 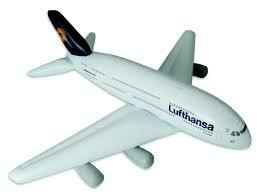 Its as if the use of new materials allowed the plane to be built with no checks and balances. In commercial development, we say that the addition of a new use beyond the first use CUBES the risk of failure. Again, here, the use of any completely new and untested technology or system beyond the first CUBES Risk, Thats why I will fly on this plane only when I am sure all the bugs are worked out. No I do not have personal knowledge that my assertions about the process are correct. But since I am the guy who might be on the plane when modifications need to be made, I have a right to my opinion about how they went about this. The company can be run is a way that removes liability from all of the people on executive row. The Chairman of the company seems to be in Chicago. He may not understand that the issue is that the plane has to fly. Is it flying? No. Maybe he needs to go to Seattle and do his job. Each and every part or component may be made correctly, or a system or sub assembly is made and does work well on its own, but when spliced to other parts or systems it does not work, then the plane does not fly. Having "expensive" american labor solve problems in the shop many not appeal to management, but when the parts are assembled from places on all seven continents, they all have to work together and the plane has to fly. Fancy That. How smart was it to make components all over ? Everyone now knows.